Cy-Boar, written and drawn by Lou Graziani, is a webcomic & series of comic books about a mutated bionic boar that escaped from an illegal military research lab. Along the way, the story sometimes focuses on other characters such as a team of commandos from the Pentagon and Cy-boar’s fellow escaped animal, Squirrel. Cy-Boar was first created as a series of xeroxed comics in 1997 by Lou Graziani’s Brother and a friend. The comic was put online as a webcomic in 2005. 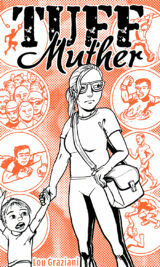 It is updated with new comic pages or fan art every week, sometimes 2 or three times a week. 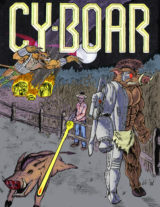 Cy-Boar is basically a sci-fi fantasy adventure in the same vein as the Ninja Turtles. Cy-Boar exists in a world of fantastic weapons, secret agents and Government Conspiracies. All of that is a back drop though to illustrate concepts about socialization, group dynamics or ethics. The early pages of the Cy-Boar website were drawn as far back as 1988. Lou included these early crude drawings to show artistic progression from his older comics to his new pages created each week. The website included colored and reformatted versions of all of the older Cy-Boar comics that were originally never intended to be put online. While many artists are embarrassed by their older art, Lou likes to showcase the progression (and improvement) of his art over the years. 271 queries. 4 mb Memory usage. 0.482 seconds.